It’s March 14th! Or as nerds and dessert lovers reference it — National Pi(e) Day! I wanted to do something special for this unconventional holiday and was excited when I saw a picture for this in Women’s Day magazine. There was only one problem, that’s all it was — a picture. No instructions or anything. So I wanted to share the how-to of it with you (although it’s simple) to help you celebrate too. If you read the blog often, you notice that I often want to make a recipe and then realize I don’t have all the neccesary ingredients so I skip whatever that thing is or put whatever I want in the dish to replace it. Well that sort of happened today, except I had already started making this jarred pie when I realized I didn’t have everything. So what didn’t I have? The pudding. There was no way I could skip it, although I did consider Nutella and hot cocoa powder as acceptable substitutions. I had literally just come home from the store and I am a little under the weather thanks to allergies so I tried to fight myself on leaving the house again. I was so excited to eat this dessert by this point that I couldn’t just come up with a new idea….so off to yet another store to buy ONE box of instant pudding I went. I have to say that this is one of the sweetest snacks I’ve had in a long time. 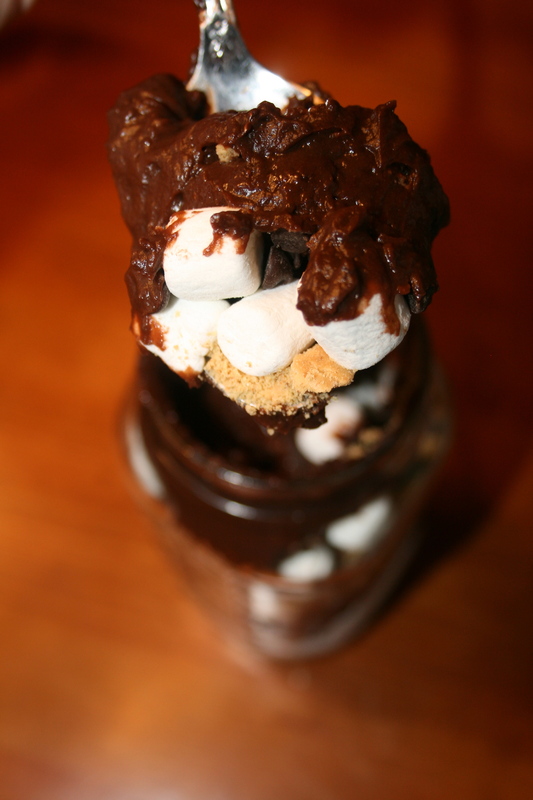 I mean, basically it’s sugar and graham cracker covered in chocolate and handed to you in a cup. Not that I’m complaining. 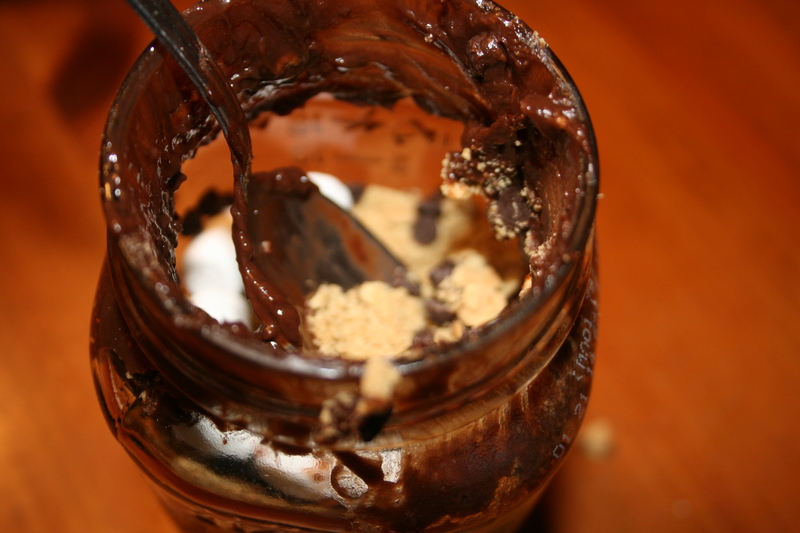 I looked at my finished mason jar and though to myself, ‘who in their right mind would or could eat an entire one of these?’ and then I found myself halfway through it. I would have finished the other half but then I remembered I promised myself I’d be 10 pounds lighter for my cousin’s summer wedding. Oh, deadlines. 1. In a food processor or mixer, crumble graham crackers until it is a smooth powder. 2. In a large bowl, make the pudding as the package directs. 3. 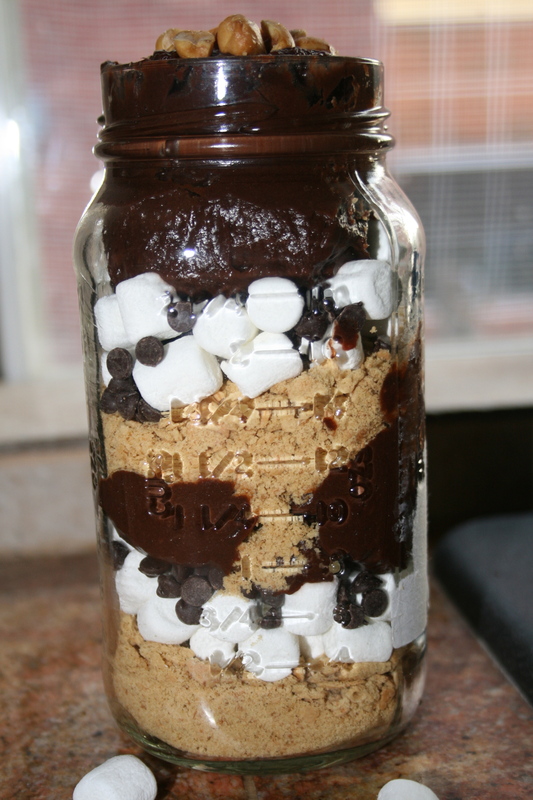 In your mason jar, layer graham cracker, marshmallow, chocolate chips, and pudding until the jar is full. 4. Top the pie with the peanuts. 5. Grab a spoon and enjoy. 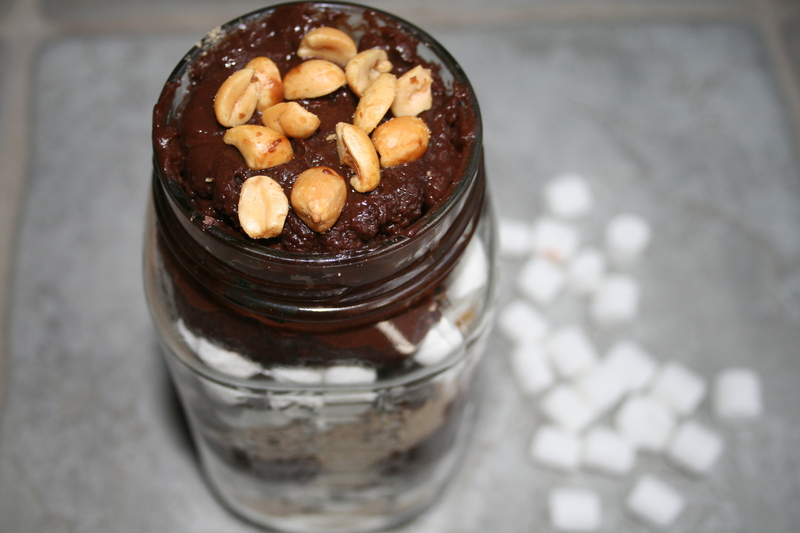 This entry was posted in Desserts and tagged chocolate, mason jar, pie, rocky road. Bookmark the permalink.